Car Checklist: A full tank of fuel to avoid filling up on Whidbey Island. Not all of my drives are intended to keep your adrenaline pumping. While I do start this drive by taking Pioneer Highway to La Conner, this drive is filled with several stops and exploring Whidbey Island as well as a ferry ride to end the drive. This will be a great drive for photographers, those of you with you kids, or a date day. 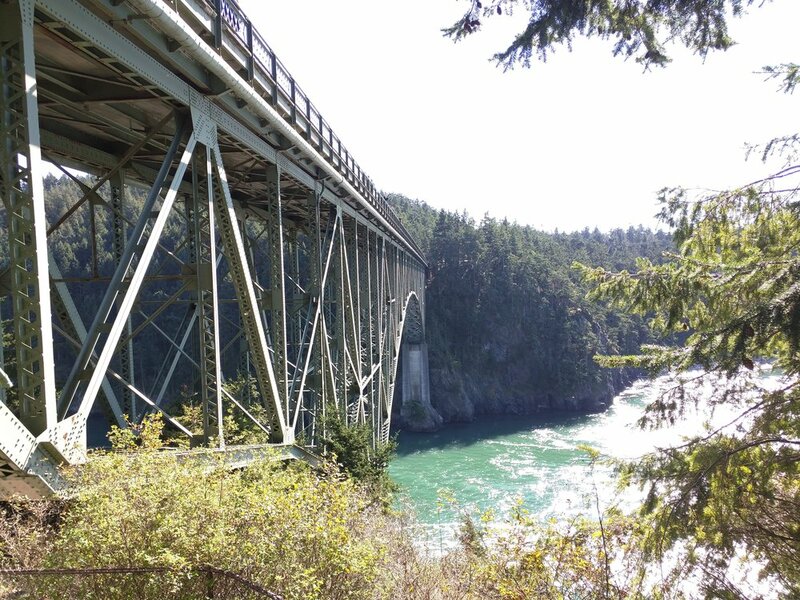 This drive can be a little tough for groups as it's difficult to find parking on Deception Pass Bridge and in the town of Coupeville, but we've done it with a smaller group and had a great time. As usual, starting early will make this drive so much better. You can easily make this trip on a single tank of gas, so it's best to fill up before you leave. Once on the drive, you can get a big breakfast at your first stop in La Conner at the Calico Cupboard. You should probably just forget your diet if you do though; this is old school, heavy cooking at it's best. You can walk the river boardwalk here and explore, but I recommend getting a move on as the best is yet to come. You'll head out of town going south and over the bridge into the Swinomish Reservation. The bridge is the perfect spot for a photo if there's no traffic, so try and time it so no one is behind you. Next you'll arrive at Deception Pass. There are 3 parking areas, but they fill up fast so grab the first spot you see, no matter where it is. If you're not afraid of heights you have some gorgeous views of the ocean here. Take your time and explore. I've seen baby seals and pods of whales here pretty often! From there follow Highway 20 until you can take a left onto Madrona Way. This is a fun little highway detour that has some nice views and some fun turns. You'll end up right in Coupeville where you can visit Toby's Tavern (which actually has good food if you're ready for lunch, but is 21+) and you can walk around and explore the Wharf. It's a fun little town with good shops and the Ice Cream at Kapaws is delicious. When you're all full there you can head to Fort Casey via the road to Ebey's Landing for a short, but better drive. Note that a Discovery Pass works here or there's a single day pay station in the main lot. I grew up camping and playing with friends here and it's a cool spot to explore for a few hours as well as picnic. Make sure to walk or drive to the Lighthouse and soak in some history too. During normal hours you can take the tiny stairs to the top and get a birdseye view of the sound from there. After you're finished you'll hop on the Clinton-Mukilteo Ferry and I highly recommending ending your day at the Diamond Knot Brewery and Alehouse just off the ferry. Good food and good beer and yes, your kids can get in here!